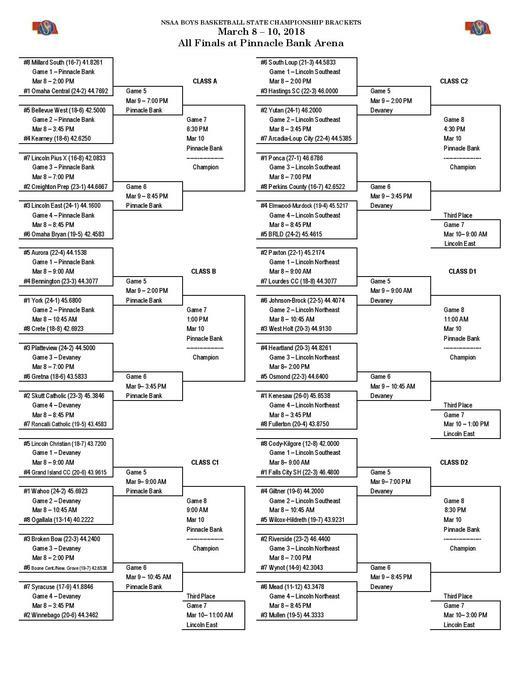 The Nebraska boys state basketball tournament kicks off Thursday, March 8th and will run through the finals Saturday March 10th at both Pinnacle Bank Arena and the Devaney Center in Lincoln. No. 1 Omaha Central vs. No. 8 Millard South: March 8th, 2 p.m.
No. 5 Bellevue West vs. No. 4 Kearney: March 8th, 3:45 p.m.
No. 2 Creighton Prep vs. No. 7 Lincoln Pius X: March 8th, 7 p.m.
No. 3 Lincoln East vs. No. 6 Omaha Bryan: March 8th, 8:45 p.m.
No. 5 Aurora vs. No. 4 Bennington: March 8th, 9 a.m.
No. 1 York vs. No. 8 Crete: March 8th, 10:45 a.m.